The Japanese practice of Forest Medicine,or Shinrin-Yoku, has gained quite a bit of notoriety of the past few years. Dr. Qing Li is the person who helped develop this practice and promote it first in Japan, and subsequently around the world. I first worked with Dr. Li in 2011, and had the opportunity to meet with him in 2013 where we presented at a conference about the International Society of Nature and Forest Medicine. Qing Li and Mark Ellison hosting the first North American INFOM meeting. Dr. Li is a physician at Tokyo’s Nippon Medical School, a visiting fellow at the Stanford University School of Medicine, is a founding member and chairman of the Japanese Society for Forest Medicine, a member of the Task Force of Forests and Human Health, and the vice president and secretary general of the International Society of Nature and Forest Medicine. He has a new book that will be released in April 2018: Forest Bathing: How Trees Can Help You Find Health and Happiness which will provide insights to how nature impacts our health and how to experience Shinrin-Yoku. I recently had the opportunity to get feedback from Dr. Li about his new book recently. What is the focus of this book? Is Forest Medicine becoming more widely accepted? What countries are in the forefront of developing forest therapy bases and or integrating access to nature as a primary public health initiative? How do you practice Shinrin-Yoku? Spending time in nature has many benefits for the mind, body, and spirit. Take time to learn more about Shinrin-Yoku in your efforts to maximize your health and well-being. I recently had the opportunity to interview Qing Li, MD, PhD, Associate Professor at Nippon Medical School in Tokyo, Japan. Dr. Li has been at the forefront of forest medicine research on the practice of shinrin yoku (forest bathing), which is walking in the forest to obtain the health benefits. 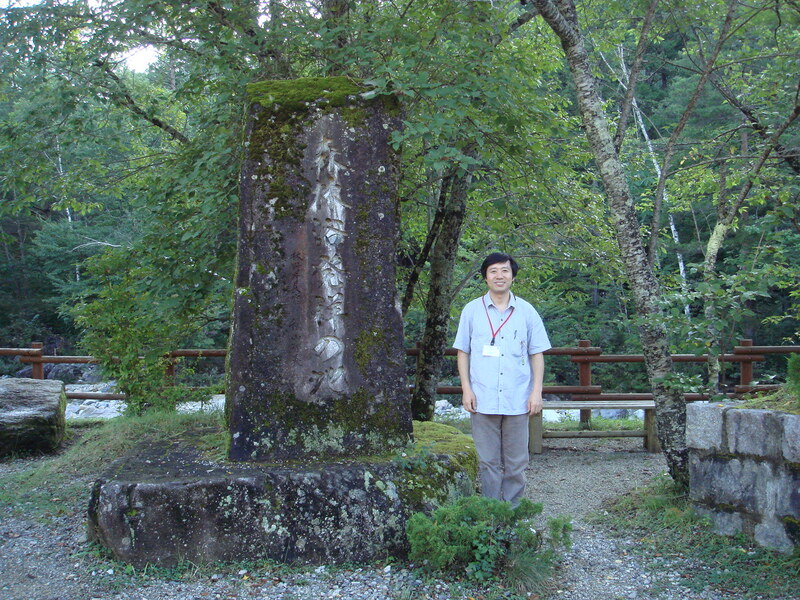 Dr. Li is also the Vice-President and Secretary General of the International Society of Nature and Forest Medicine based in Japan. I have been collaborating with Dr. Li in hopes of establishing this organization in North America. Dr. Li was also recently interviewed for a program on BBC Radio called ‘The Secret Power of Trees’ which will be broadcast on Saturday, December 8, 2012 at 10:30 a.m. UK time. Outside Magazine recently published an article in its December 2012 issue on “The Nature Cure” which also features Dr. Li’s research. Hiking Research: Why are you interested in forest medicine? How did you become involved in this type of research? Dr. Qing Li: In 1982, the Forest Agency of Japan first proposed a new movement called “forest bathing trip” as a healthy lifestyle. Now it has become a recognized relaxation and/or stress management activity in Japan. However, there has not been sufficient medical evidence supporting the therapeutic effects of forest bathing trips and evidence-based evaluation as well as a therapeutic menu of forest bathing trip have been requested. Against this background, the Ministry of Agriculture, Forestry and Fisheries of Japan initiated a research project between 2004 and 2006 to investigate the therapeutic effects of forests on human health from a scientific perspective. In fact, my major is Environmental Medicine, especially in the field of Environmental Immunology. 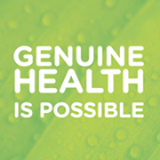 I have been studying the effects of environmental chemicals, stress and lifestyle on immune function since 1988. I am interested in the effect of all environmental factors on human health. I am also interested in the effect of forest environments on human health. Because of my background, when the Ministry of Agriculture, Forestry and Fisheries of Japan organized the project team, I was invited as a main member of the project team. Hiking Research: Has forest medicine been accepted by “traditional” medicine practitioners in Japan as a treatment for health issues? Dr. Qing Li: The Forest Medicine has been accepted by “traditional” medicine practitioners in Japan as a preventive medicine for health issues, but not as a treatment for health issues. Hiking Research: Do organizations in Japan provide employees paid time to experience nature? Dr. Qing Li: Some companies in Japan hold study and training meetings for new employees in Forest Therapy bases. Some companies make a contract with Forest Therapy bases for providing employees time to experience nature. Hiking Research: What are your suggestions for optimizing a forest bathing experience to obtain the greatest benefits? Dr. Qing Li: Usually I suggest working men and women take a two-night/three-day trip to forests for obtaining the better benefits. Because one day trip is too short and more than three day trip is too long. However, a longer trip will be better for senior citizens. Hiking Research: How much forest area is needed to obtain these benefits? Do certain types of trees offer more benefits? Dr. Qing Li: In Japan, forest is used to refer to land with a tree canopy cover of more than 30 percent and area of more than 0.3 ha. The trees should be able to reach a minimum height of 5 m with a width of more than 20 m. The forests including Japanese cypress (Chamaecyparis obtuse, Hinoki in Japanese), Japanese cedar (Cryptomeria, Sugi in Japanese) have shown beneficial effects. 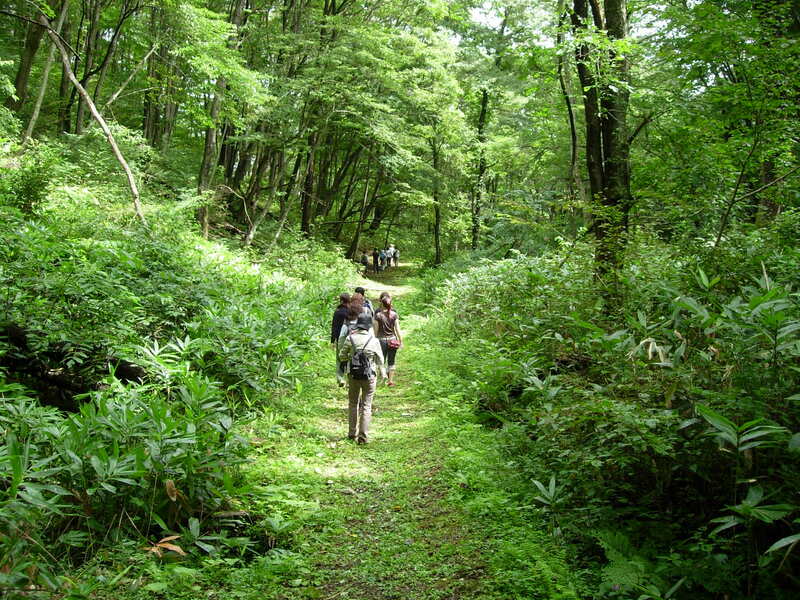 Hiking Research: Japan has designated Forest Therapy Bases. How are forests validated? Who does this? Physical factors: air temperature, humidity, illuminance, radiant heat, air current (wind velocity), sounds (the sound of a waterfall, the whispering of the wind in the trees), and so on. Chemical factors: volatile organic compounds derived from plants (trees), such as alpha-pinene and limonene, which are terpenes including hemiterpenes, monoterpenes, sesquiterpenes, and diterpenes, also called phytoncides. Psychological factors: those factors reflecting the subjective evaluation of forest environments such as hot/cold, light/dark, tense/relaxed, beautiful/ugly, good/bad, relaxing/stimulating, quiet/noisy, and plain/colorful. Semantic Differential (SD) is usually used to evaluate the psychological responses to forest environments. The technique was originally developed to measure affective responses to stimulus words and concepts in terms of ratings of bipolar scales defined with adjectives on each end. The SD methodology is considered a simple, economical means of obtaining data on emotional reactions that could be used in many different situations or cultural contexts. Physiological effects: Data/evidence obtained from experimental studies including field investigations and laboratory experiments, .i.e., investigations on the effect of walking in forests and natural environments on psycho-neuro-endocrino-immunology. These experiments study the effect of forest environments on the central nervous system (prefrontal cerebral activity, functional MRI), the sympathetic and parasympathetic nervous systems (blood pressure, heart rate variability), psychological responses (the POMS test), the endocrine system (stress hormones such as cortisol and adrenaline), and the immune system (NK activity, intracellular anti-cancer proteins in NK cells) determined by physiological, biological, biochemical, psychological, and immunological methods. Recent technological developments have enabled us to conduct the above investigations in a forest field. A research team evaluates the forests and a Committee designates the Forest Therapy Bases based on the results obtained by the research team. Hiking Research: Can forest therapy bases be started in other countries? What is the process? Hiking Research: Describe the connection Japanese citizens have with the natural environment. How active are they in visiting the forest therapy bases to experience the benefits of shinrin yoku? 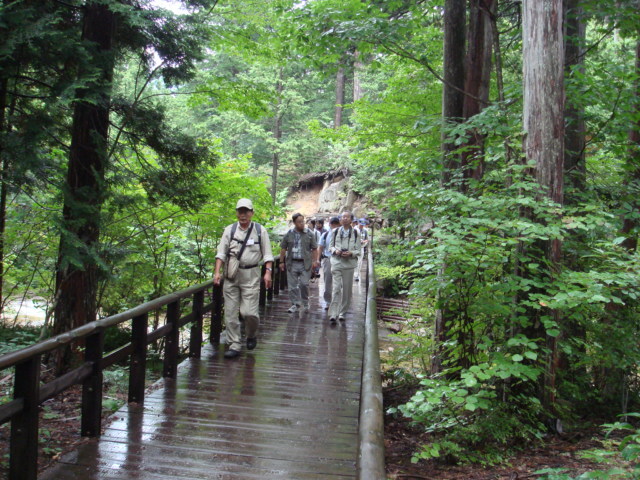 Dr. Qing Li: Walking in forests has now become a well-recognized relaxation and/or stress management activity in Japan. Many people in Japan visit the forest therapy bases to enjoy the forest bathing trip and to experience the benefits of shinrin yoku during weekends and holidays. I also visit forest parks during weekends and holidays. 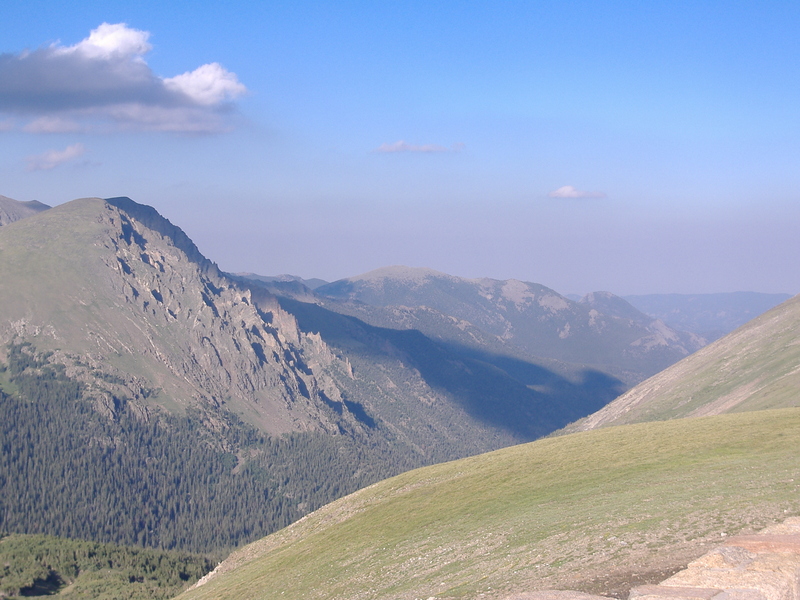 Hiking Research: What research projects are you currently involved with? Dr. Qing Li: I am doing a project on the preventive effect of forest walking on life-style related disease. In my university (Nippon Medical School), I have a special program of Forest Medicine for medical students. In this program, eight to thirteen medical students visit city green parks in Tokyo every Monday afternoon for about 2 hours during April to November to enjoy the effect of forest bathing. The students take questionnaires before and after the walking to evaluate the psychologically calming effect. This program started from 2009. 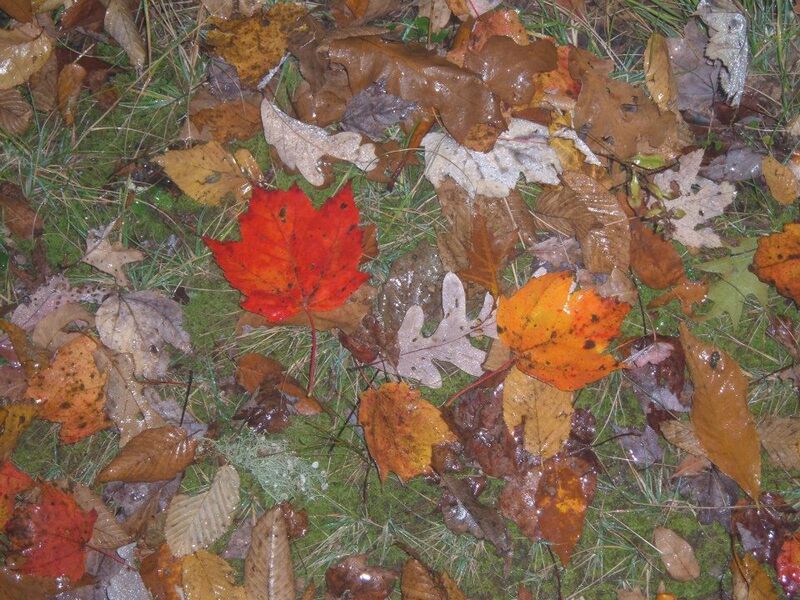 Hiking Research: What do you see as emerging trends in nature and forest medicine? Dr. Qing Li: Imagine a new medical science that could let you know how to be more active, more relaxed and healthier with reduced stress and reduced risk of lifestyle-related disease and cancer by visiting forests. This new medical science is Forest Medicine. Forest Medicine has emerged as a new interdisciplinary science and a focus of public attention. Forest Medicine belongs to the categories of alternative medicine, environmental medicine and preventive medicine and is the study of the effects of forest environments on human health. Nature and Forest Medicine will prevent people from cancers and lifestyle-related diseases such as heart disease, diabetes, cerebrovascular disease, depression and hypertension. Outside Magazine’s December 2012 issue includes an in-depth article by Florence Williams entitled “The nature cure: Take two hours of pine forest and call me in the morning.” Williams describes the emerging focus on the connection between nature and health as the “slow nature movement.” The article is the most complete review of its kind in a magazine that I have found, and pieces together the research taking place around the world. She cites the work of Alan Logan, Richard Louv, Rachel and Stephen Kaplan and others who have helped raise awareness of the links between nature and health. Williams visited Japan to learn firsthand about the practice of shinrin yoku, or forest bathing, which is walking in nature to obtain the health benefits. Shinrin yoku is a Shinto and Buddhist inspired practice that “lets nature enter the body through all five senses.” She discovered that forest bathing has been standard preventive medicine in Japan for thousands of years. The stressed masses from Tokyo and other urban areas flee to the forest for rejuvenation, trying to escape “karoshi” or death by overwork. 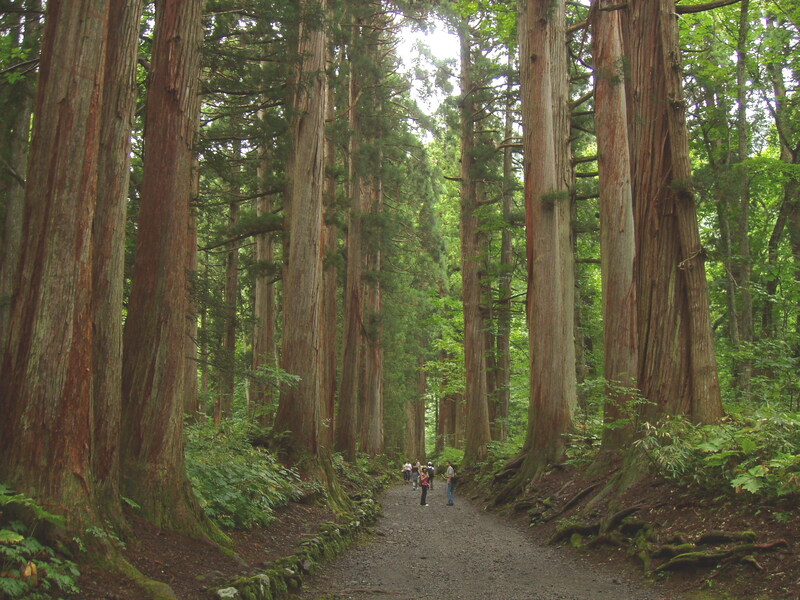 Between 2.5 million and 5 million visitors walk the “Forest Therapy Trails” in Japan each year. The Japanese government currently has 48 “Forest Therapy Bases” with plans to expand to 100, and has spent over $4 million on forest bathing research since 2004. The South Korean government believes in the practice as well and is investing $140 million for a National Forest Therapy Center to be completed by 2014. Williams interviews Yoshifumi Miyazaki, a physiological anthropologist and vice director of Chiba University’s Center for Environment, Health and Field Sciences. Miyazaki emphasizes that spending time in nature helps facilitate a feeling of comfort because our rhythms become synchronized with those of the environment. During her visit to Japan, Williams also talks with Dr. Qing Li, Senior Assistant Professor at Nippon Medical School in Tokyo who has done extensive research on how spending time in forests impacts the immune system. Dr. Li is asked how he utilizes nature for health and describes using cypress oils for aromatherapy nightly. He also suggests taking a vacation to nature, not the city; at least one weekend a month visiting a natural area; visiting a park at least once a week; trying to walk under trees when walking in urban areas; and going to quiet places, preferably near water. Williams also reviews some of the recent research linking time in nature to improved health, and provides suggestions for how to connect with nature. This article is an excellent overview of where the emerging field of forest medicine is headed. A key observation made by Williams is that in the United States “researchers are mostly showing people pictures of nature, while the Japanese are pouring it into every orifice.” To validate the claims that “nature heals” and gain acceptance as a viable preventative healthcare option, the Japanese approach to research must be more fully embraced in the United States. As research continues to reveal “a nature cure”, hopefully more in the U.S. will take notice and loosen their grip on their smart phone long enough to experience the benefits nature has to offer. Park, B., Tsunetsuga, Y., Kasetani, T., Kagawa, T., & Miyazaki, Y. (2010). The physiological effects of Shinrin-yoku (taking in the forest atmosphere or forest bathing): evidence from field experiments in 24 forests across Japan. Environmental Health Preventive Medicine, 15(1), 18-26. Abstract: The results of studies performed on the physiological effects of Shinrin-yoku show that forest environments could lower concentrations of cortisol, lower pulse rate, lower blood pressure, increase parasympathetic nerve activity, and lower sympathetic nerve activity compared with city settings. The results of the physiological measurements suggest that Shinrin-yoku can aid in effectively relaxing the human body, and the psychological effects of forest areas have been correlated with the various physical environmental factors of forest. The studies of Shinrin-yoku provide valuable insights into the relationship between forests and human health. The health promoting and stress reducing benefits of Shinrin Yoku that have been found through scientific research in Japan offer many possibilities for improved public health in other countries, including the United States. Research on this topic has been occurring for several years in Japan, but not as extensively elsewhere. More emphasis needs to be placed globally on research exploring how nature impacts physical and mental health, as well as on the development of programs that help people connect to nature. This can have a tremendous impact on public health and have positive financial implications for individuals, governments and organizations as a result of having healthier, more effective employees, and lower healthcare costs. other similar plant produced chemicals, helps to lower stress levels. Subsequently, increased levels of natural killer cells (NK), and NK cells activity were observed. NK cells help the immune system fight off viruses and other pathogens, and kill tumors and other virus infected cells, including cancer. Research is beginning to reveal the health benefits that nature offers. Additional empirical research on the psychological and physiological benefits of spending time in nature is needed. With this evidence, health care providers can begin to offer “nature prescriptions” for regaining or maintaining health, and organizations can begin to fully embrace the use of nature for improved employee health and enhanced workplace performance. Li, Q. (2010). Effect of forest bathing trips on human immune system. Environmental Health Preventive Medicine(15), 9-17.